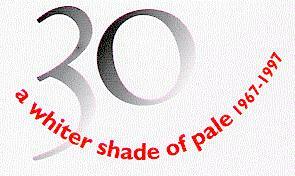 The A Whiter Shade of Pale and Procol Harum thirty-year anniversary was held at Redhill on 19 July 1997. At the first anniversary of this unique event, 'Beyond the Pale' asked some of the participants to write their impressions from Redhill – one year after. As well as reading these anniversary reminiscences, kindly sent in by 'Beyond the Pale' visitors, please contribute a message to our 'Still There'll be More' forum, requesting further activity from Procol Harum: click here. And if you were at Redhill, we invite you to write your story. Send it by e-mail to 'Beyond the Pale' as soon as you like, to be included in a future update of this page. Merchandise from Redhill – memorabilia still available – the excellent 32-page souvenir programme reviewed here.